Last edited by ricktendo64 on Thu Jun 09, 2011 11:42 pm, edited 1 time in total. Thanks, rick. I'll keep an eye out. That update has a different file version for x64, probably because it appears to have been fixed in 2003 before XP. It's still v2 like the XP fix, but with the following version which for me is the same as KB982663-v2-x64. And the registry entries added are the same. Thanks for the notification, rick. Those updates should make today's releases more interesting. I'm assuming your link on WinCert to SoLoR's share is the source, correct? 5eraph wrote: I'm assuming your link on WinCert to SoLoR's share is the source, correct? Oh my god, these IE8 hotfixes even contain newer files than latest ie update. I'll wait to see whether there are even newer hotfixes..
Has anyone checked to see if the current listings in the Microsoft Update Catalog are accurate and complete for today? Microsoft Update is always belated compared to Microsoft Download, but I have just checked it, it's complete now. From my experience, Microsoft Download always comes first, but sometimes the search by catalog won't work so you have to manually search by typing windows xp. Only that the latter may miss other updates such as .NET. Then after about 1 hour, Windows Update is ready for new updates. Than again after 1 hour, KB Articles become available. Thanks for the Flash reminder, rick. KB982664 was also released today despite the fact that the Microsoft Download site states release was six days ago. I couldn't find it yesterday. It doesn't show up on the Microsoft Update site for me either, which is strange. KB982316 just popped up on KBUpdate.info. It's a security update that does not appear on the Microsoft Update site, for me at least. It could be worth including for those that haven't released their packs yet. Last edited by ricktendo64 on Wed Aug 11, 2010 3:30 pm, edited 2 times in total. Thanks for the code. I'm still looking into it. Thanks for the pictures. I wouldn't have known where to check otherwise. There is no such code in the XPx64 package, only updated files (TAPISrv.dll and wTAPISrv.dll). However, by default neither LOCAL SERVICE nor NETWORK SERVICE have Full Control of the Telephony key on XPx64 and 2003x64, so the security descriptors are not necessary for me to use. Oh, thanks, I missed KB982316. My search on Microsoft Download didn't show it up yet. And thanks for the remind of security descriptors, and the reply in my IE8 thread. EqualOp = CheckReg, HKLM, "SYSTEM\CurrentControlSet\Control\ProductOptions", "ProductSuite", 0x00010000, "==", "EmbeddedNT"
It wouldn't be the first time similar code's been used. Have you tried changing the registry key that the installer checks? But the code suggests that Embedded is blocked, not the other way around. If SoLoR's changelog seems as overwhelming to you as it does to me, then you may want to give this simple script a try. 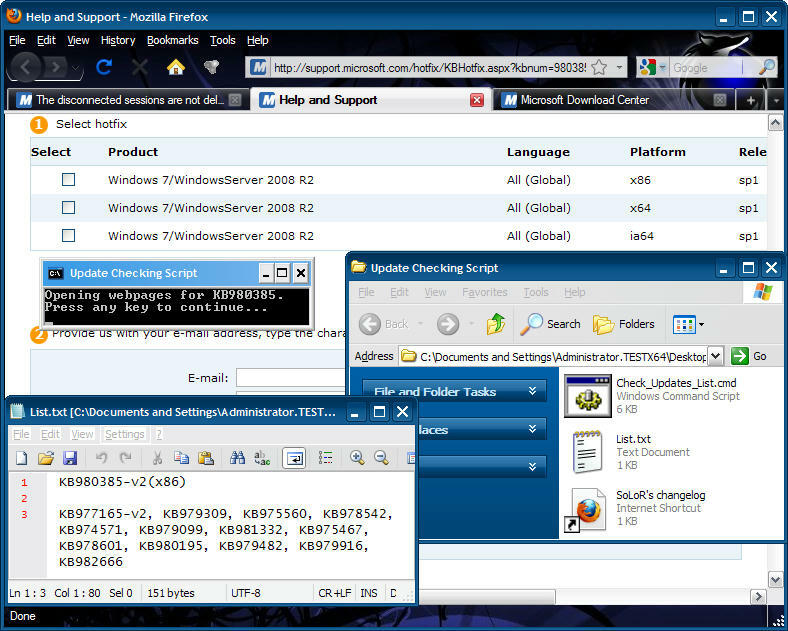 Instructions are included in the header of the CMD file, and a copy of the following screenshot is included—it takes up almost all of the package. Be certain that your default web browser is open when running this script to ensure that it works properly. If the browser is not open then one or more pages may fail to open. Example List.txt files are included. 5eraph, any way you can make it check a range of fixes? The following script will do that, Rick. I haven't seen KBs use numbers that high, so I've set the largest allowable number range from 100000 to 2999999. Feel free to tinker with the code to change it if you'd like. And thanks for the RunDLL32 commands. They've been implemented in this script. EDIT: Script has been silently updated to correct an issue when reentering range. the above example will get you KB983234, and yes you do not use the letters KB in the cmdline. If the EXE is a compiled batch file then it may be better not to compile it, user_hidden. The batch file size would be drastically smaller, and several AV vendors currently flag the EXE as malware. Thanks for mentioning KB983234, Rick. Unfortunately, it breaks 32-bit IE6 under XPx64 when opening some Microsoft sites, such as the one user_hidden's utility accesses. Further testing has shown inconclusive results. Still playing with this update. Last edited by 5eraph on Mon Aug 23, 2010 11:22 pm, edited 1 time in total. 5eraph wrote: If the EXE is a compiled batch file then it may be better not to compile it, user_hidden. The batch file size would be drastically smaller, and several AV vendors currently flag the EXE as malware. 1. You just request a lot of hotfixes from the web. In this case, I created a custom "search engine" for my browser, which directly opens the hotfix page for queried KB number. 2. go to your mail in box, I recommend you use gmail, because all mails in a same topic can be open at the same time. Then you simply copy all mails' texts(in gmail, this can be done in one step), paste them and save as a.txt in the same location where this script/exe is. 3. execute this script/exe, then just wait until the autoit icon in taskbar notification zone(tray bar) disappears. 4. run generated 7zcmd.cmd, it will automatically extract downloaded hotfixes for you. You should make sure that 7z.exe exist in the same folder or can be accessed via PATH variable. If a download is broken, then the extraction fails, the 7zcmd.cmd handles this correctly so that it won't delete broken files. Therefore you just need to browse to CHS/ENU to find which are not extracted and not deleted, just modify a.txt and keep entries of broken ones and run the script again. Updated the code and the exe. Last edited by yumeyao on Mon Aug 23, 2010 11:31 pm, edited 3 times in total. I tried that first, yumeyao. It didn't seem to work for me, which is why I had to add IExplore.exe to the START command. Your script looks interesting. I'll have a look at it later. I'm still playing with KB983234, Rick. Something else may have caused the problems I was seeing. It works for me, however. I have just updated the script, just FYI, hoping you don't miss the updated script. wow i get some sleep and the world is still awake. yumeyao wrote: It's in SP3.cab. But I found it in english xp sp3.cab, too. OK.... Now I can confirm pscrptfe.ntf exists in chinese sp3.cab, but doesn't in english sp3.cab. Thanks, user_hidden. Whenever I look for the version of KB931125 you have in your pack, it's nowhere to be found—so I pull it out of your pack and put it in mine. In case you are interested, I have repacked a rootsupd.exe, which contains also fontreg.exe and resetwmi.exe and have ADVPACK.DLL and W95INFxx.DLLs removed. Last edited by yumeyao on Wed Aug 25, 2010 9:20 am, edited 1 time in total. How do you run FontReg and ResetWMI? I don't see anything about those files in RootsUpd.inf. Oh, you are right... I forgot to modify rootsupd.inf. KB2264107 was just released in response to the recently announced "DLL preloading" attack vector. Anybody have documentation on Modes = 0,1,2,3 directive in INF files? According to TechNet, InstallDefault performs this task. Microsoft wrote: InstallDefault=0 | 1 ; Whether to install this component by default. 1=Yes, 0=No. I thought I knew about Modes at one time, but I can't remember now. Strangely enough, the article linked above gives no mention of Modes. subdir specifies the source subdirectory you want to copy the file from. 3, 4, 5 are unknown. diskid is used when running an installation from (multiple) floppy or multiple cds. subdir specifies the target subdirectory you want to copy the file to. upgradecode is a single digit that is used if this is an upgrade from an earlier version. It specifies whether the file is copied during the text-mode portion. newinstallcode1 is a single digit that is used if this is a fresh installation. The newinstallcode1 is optional; if it is not included, the file is not copied (code = 3).